The passage above represents just a portion of insights from Third World Press publisher Haki R. Madhubuti. In Yellow Black, Haki R. Madhubuti details the first twenty-one years of his life, and in doing so he brings the reader to disabuse themselves of the so-called “generation gaps” as promoted by white social theory. He does this because any African person in the world (with Haki using the United States in this context) can see the continuity of a people that have been dispersed and colonized/neocolonized at home and abroad. What is enduring about this memoir is that it is not a western “Horatio Algers” story. Haki was not some special or “chosen” child that was precocious. In fact his experiences growing up was unfortunately like many young African children growing up in America. Throughout his coming of age Haki’s humanity was never crushed to the point that he stopped being epistemologically curious. Similarly to us as the editors of Conscientization 101, Haki’s passion for learning naturally lead him to love books and reading. Through the essential act of reading Haki was able to make sense of the chaos created by being a part of an oppressed people that are taught to think of yourselves as lower than dirt by their oppressors. 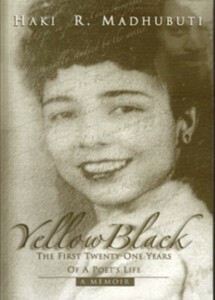 “The style of Yellow Black is a mixture of prose, prose poetry, free verse and street riffs.”2 This style creates an enjoyable and quick read (we actually finished it in one day). We can’t wait until his next memoir.